Democrats and Republicans remain extraordinarily divided in their views of the Affordable Care Act – and over what Congress should do about it – at a time when the law has become a major issue in the closing stages of the race for the White House. About eight-in-ten Democrats (82%) approve of the law while 91% of Republicans disapprove of it, according to a new Pew Research Center survey. Independents are more evenly split on the question, with 41% approving and 54% disapproving. But among independents who lean to the Democratic Party, 64% approve of the law, while 85% of independents who lean Republican disapprove of it. Partisans have long been sharply divided over the health care overhaul itself, but they are growing farther apart in their views over what should be done about the law. About two-thirds of Democrats (68%) now say Congress should expand the law, up from 50% in March 2012. Just 18% of Democrats now say Congress should keep the law as is, down from 31% four years ago. 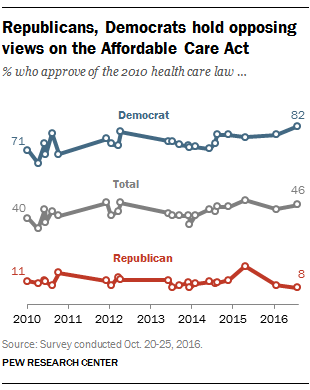 Among Republicans, 85% favor repeal, up from 74% in March 2012, while the share that supports keeping the law as is has declined from 10% then to 5% now. An overwhelming 94% of registered voters who support Trump disapprove of the Affordable Care Act. By contrast, about eight-in-ten supporters of Democrat Hillary Clinton (82%) approve of it. This represents one of the biggest areas of disagreement between supporters of the two candidates. About seven-in-ten (69%) of those who support Clinton say Congress should expand the law, while 20% of her backers say Congress should leave it as is. But among Trump backers, 88% say Congress should repeal the law. These views are mostly in line with what each candidate has proposed: Clinton has promised to “defend and expand” the law while Trump has vowed to “repeal and replace” it. 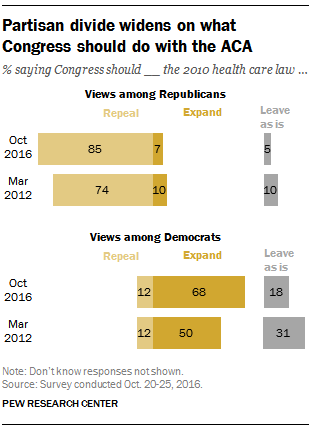 Overall, views of the health care law are divided among the general public. The law has the approval of 46% of adults while 51% disapprove, little changed since April, when 44% approved and 54% disapproved. In July 2015 – shortly after the Supreme Court upheld the federal government’s ability to provide insurance subsidies via the federal exchanges established by the law – nearly equal shares approved (48%) and disapproved (49%) of the law. Among all adults, 40% say Congress should expand the law and an additional 13% say lawmakers should leave it as is. That compares with 44% who want Congress to repeal the law. Since March 2012, both the shares who want to expand the law and repeal it have increased (up 7 and 6 percentage points, respectively), while the share who say Congress should leave the law as it is has declined.